I made a lesson on 謙遜 ( = kenson): How to sound more humble in Japanese, many years ago. 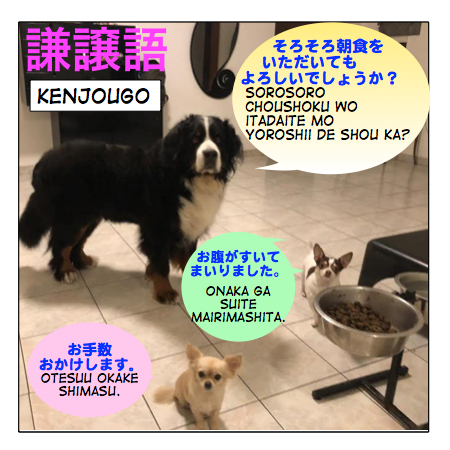 By request, I will teach you the “humble form”, 謙譲語（けんじょうご = kenjougo), with today’s cute guest teachers, Bruno, Khyra and Leo. こんにちは！ = Konnichiwa! = Hello! I’m Bruno. I will make a lesson for you with my sister Khyra, the sweet little princess, and Leo, the funny fellow. Even though we’re a bit hungry, we would like to give you a lesson on “humble form” in Japanese. When you talk to a “superior” (Note: In Japanese by “superior” we mean someone older than you, or higher ranking in your company like your boss, or someone you need to show respect to like customers, clients, etc.) you have to use polite Japanese. You have to change the politeness level depending on who you are talking to. (1) Casual speech: Between friends. : dictionary form (sometimes you attach, casual suffix, の ( = no)? ) for a question. = Maggie, ashita, nanji ni gakkou ni iku? = What time are you going to the school tomorrow, Maggie? = Maggie sensei, ashita, nanji ni gakkou ni ikimasu ka? (3) If you respect me a lot, you use 敬語 ( = keigo) honorific form. = Maggie sensei, ashita, nanji ni, gakkou ni ikaremasu ka? (4) There is even more polite 敬語 ( = keigo), honorific form. = Maggie sensei, ashita, nanji ni gakkou ni irasshaimasu ka? When you talk about your own actions, however, you should use “humble form”. = Ashita, gakkou ni iku. = I am going to school tomorrow. (Sometimes you attach a suffix, よ ( = yo) , ね ( = ne), etc. = Ashita, gakkou ni ikimasu. = Ashita, gakkou ni mairimasu. = Ahista, gakkou ni ukagai imasu. = I am going to school to see you. So today we will focus on 謙譲語 ( = kenjougo) humble form. When you talk about your own actions to a superior, you should use “humble form”. The basic idea is you lower yourself by being humble to show your respect to a “superior”. And you can tell how humble you are by the words you choose. 行きます ( = ikimasu), means “I’m going”. And it is polite enough, but 参ります ( = mairimasu) — the humble form — shows more respect. *You also use the humble form when referring to people in your group (family members or coworkers, etc.) when you talk to other people. = I will make my son go visit you. = Buka no Saitou ga ukagaimasu. = My subordinator, Saito, will go visit you. How to make the humble form. 1) The simple way to make a verb into the humble form. →お作りします= おつくりします = otsukuri shimasu. →お作り致します = おつくりいたします= Otsukuri shimasu. = Watashi / (more polite) Watakushi ga yuushoku wo otsukuri shimasu. = I will make dinner (for you). Note: You can’t tell the politeness level by reading English translation. But all these example sentence are very polite. = Osara wo osage shimasu. = Osara wo osage itashimasu. Note: You attach お ( = o) to specific nouns to make them sound more polite. = Otearai wo okari shite mo yoroshii desu ka? = May I use the bathroom? = Ocha wo oire shimasyou ka. = May I serve you some tea? = Oheya no kagi wo oazukari itashimasu. (Note: the implication here being the staff will hold onto it for the guest). = Goshitsumon ni okotae shimasu. = I will answer your question. / Let me answer your question. = Oheya made goannai itashimasu. = I will take you to the room. = Okuruma no goyoui itashimashita. = We arranged your car. = Sono ken ni tsuite gosetsumei itashimasu. = I will explain the matter. / Let me explain the matter. = Ashita, mata gorenraku itashimasu. = I will contact you again tomorrow. = Kochira kara odenwa itashimasu. = I will call you. / I will give you a call. = Atarashii seihin wo go shoukai itashimasu. = Allow me to show you our new product. = May I help you? 2) Now, a lot of verbs have their own humble form. = Tanaka san irasshaimasu ka? = Is Mr. / Ms. Tanaka there? = Yes, he / she is. = Okosan wa irasshai masu ka? = Do you have children? = Yes, I have two. = Hisho ga kyuu ni yamete komatte orimasu. = My secretary quit all of a sudden, and I’ve been having a trouble. = Kodomotachi mo genki ni shiteorimasu. = My children are also doing well. = It has been a long time since we met before. 行く( = iku = to go) and 来る ( = kuru = to come) have opposite meaning but we use the same humble verbs. = Ashita, asa no hachiji ni mairimasu. = I am coming / going there at 8 am tomorrow. = Nanji ni ukagattara yoroshii deshou ka? = What time should I go /come visit you? = Onimotsu wo otodoke ni mairimashita. = I came here to deliver a package. = Yuubin ga kita ka douka mite mairimasu. = I will go check if the mail has come. = Jikai wa kodomo wo tsurete mairimasu. = I will bring my child next time. = I am getting hungry. When you leave your house/office. = I am leaving now. = Senjitsu, sakuhin wo haiken shimashita. = I saw your work the other day. →(masu form) 拝聴します = はいちょうします= haichou shimasu. = Kouen wo haichou shimashita. = I heard your lecture. →(masu form) お目にかかります= おめにかかります= ome ni kakarimasu. = Ashita, ome ni kakaritai no desu ga.
= I would like to see you tomorrow. →(masu form) 申します = もうします = moushimasu. →(masu form) 申し上げます = もうしあげます= moushiagemasu. = Kokoro yori owabi moushiagemasu. You see 申し上げます ( = moushiagemasu) a lot in formal written greetings. = Kokoro yori kansha moushiagemasu. = I would like to express my sincere appreciation. = Summer greetings. / Best wishes for summer season. = Kokoro yori okuyami moushiagemasu. = Please accept my sincere condolences. To someone who changed jobs, got promoted, or is about to move away, etc. = Kongo no gokatsuyaku, kokoro yori oiwai moushiagemasu. = Wishing for your great success in your future from the bottom of our heart. Many of you already know the line いただきます( = itadakimasu) which you say before you eat. Now you know the real meaning. →I am going to eat. いただく ( = itadaku) can be used for when you drink or receive something as well. = I’ll have some coffee. = Kinou, otonari san kara oishii okashi wo itadaita. = I received some delicious sweets from our neighbor yesterday. = Okashi wo choudai shita. =Yukari: Maggie Sensei. Thank you for always helping me. This is a diamond collar for you. Please accept it. = (Direct translation)Maggie: I will just take your thought. = Maggie:I can’t take it (No thank you) but I appreciate the thought. = Honjitsu wa otanoshimi itadakereba to zonjimasu. = I hope you have a good time today. = Oisogashii to wa zonjimasu ga douzo ojikan arimashitara irashite kudasai. = I know you’re busy, but please come when you have time. = Maggie Sensei wo gozonji desu ka? = Do you know who Maggie Sensei is? Note: When you talk about someone else, you use 敬語 ( = keigo) honorific form. The honorific form of 知る( = shiru) is ご存知 ( = gozonji). = Yes, I know her. = No, I don’t know her. = Sengetsu, Toukyou ni hikkoshi itashimashita. = I moved to Tokyo last month. = Yes, I know (about that). = Sore wa zonjimasen deshita. = I didn’t know that. Note: Again, the English translation is very simple but all these Japanese sentences are very polite. Be careful not to use these humble forms to describe someone else’s action who is not related to you or in your group. = Hashimoto san wo zonji de orimasuka? = Do you know who Mr. Hashimoto is? = Hashimoto san wo gozonji desu ka? So you have to know right honorific form to refer to someone’s action. = Minasan, kono ressun wo saigo made oyomi itadaki arigatou gozaimashita. = Thank you for reading this lesson through to the end. = Soredewa shitsurei shite korekara oshokuji wo itadakitai to zonjimasu. = Now if you’ll excuse us, we’re going to eat now. = Bruno Sensei, Khyra, Leo, arigatou! = Thank you, Bruno Sensei, Khyra and Leo! = Douzo, asagohan wo goyukkuri meshiagatte kudasai. = Please enjoy your breakfast. Thanks for the posts! It really helps me with learning Japanese. Thank YOU for visiting this site! 😊　I’m glad to hear my lessons help you learn Japanese.